Hello everyone, welcome back to my channel. 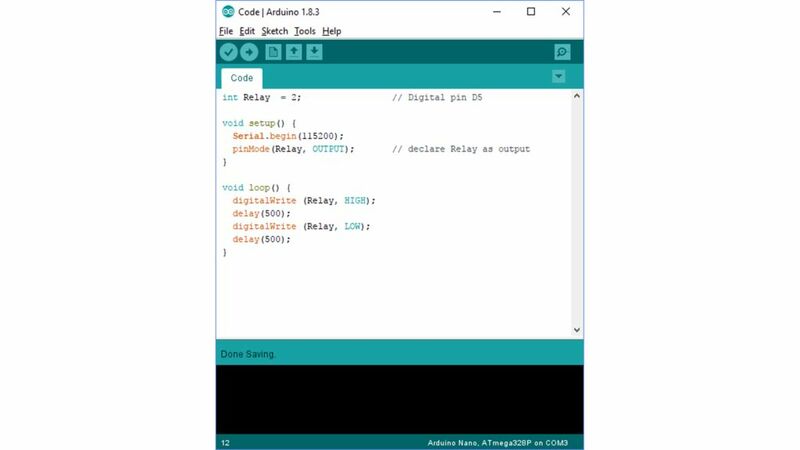 This is my 4th tutorial on how to drive a RELAY (not a relay module) with an Arduino. 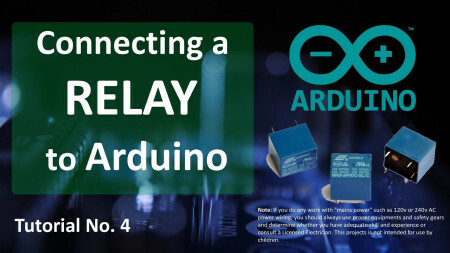 There are hundreds of tutorial available on how to use a "relay module" but I could not find a good one that shows how to use a Relay and not a Relay module. So, here we are to discuss how a relay works and how we can hook it up to an Arduino. Note: If you do any work with "mains power" such as 120v or 240v AC power wiring, you should always use proper equipments and safety gears and determine whether you have adequate skill and experience or consult a Licensed Electrician. This projects is not intended for use by children. A Relay is a large mechanical switch, which is toggled on or off by energizing a coil. 7. Multi-dimensional Relays and so on, with varied ratings, sizes and applications. However, in this tutorial we will only be discussing about an electromagnetic relays. The relay I am looking at is a SRD-05VDC-SL-C. 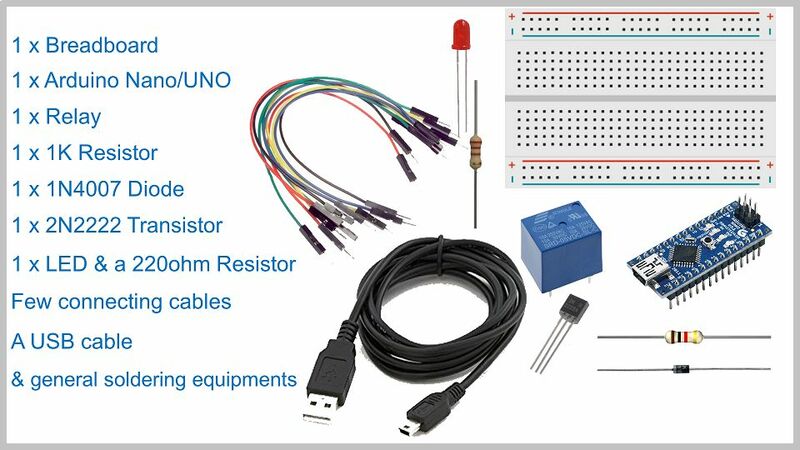 It is very popular relay among Arduino and DIY electronics hobbyists. This relay has 5 pins. 2 for the coil. Middle one is COM (common) and the rest of the two are called NO (Normally Open) and NC (Normally Close). 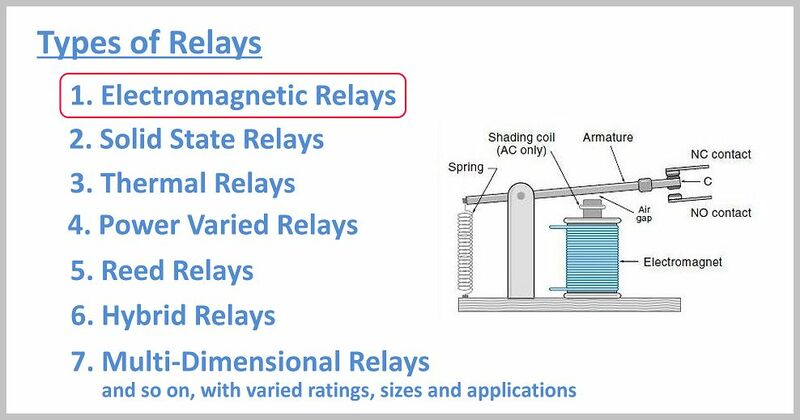 When current flows through the coil of the relay, a magnetic field is created that causes a ferrous armature to move, either making or breaking an electrical connection. When the electromagnet is energized the NO is the one which is on and NC is the one which is off. When the coil is de-energized the electromagnetic force disappears and the armature moves back to the original position turning on the NC contact. The closing and releasing of the contacts results in powering on and off of the circuits. Now, if we look at the top of the relay the first thing we see is SONGLE, it is the name of the manufacturer. Then we see the "Current and Voltage Rating": it is the maximum current and/or voltage that can be passed through the switch. It starts from [email protected] and goes down till [email protected] Finally the bottom bit says: SRD-05VDC-SL-C SRD: is the model of relay. 05VDC: Also known as "Nominal Coil Voltage" or "Relay Activation Voltage", it is the voltage necessary for the coil to activate the relay. Let’s start by determining the relay coil pins. You can do it either by connecting a multimeter to resistance measuring mode with a scale of 1000 ohm (since the coil resistance normally ranges between 50 ohm and 1000 ohm) or by using a battery. This relay has 'no' polarity marked on it since the internal suppressing diode is not present in it. Hence, the positive output of DC power supply can be connected to any one of the coil pins while negative output of DC power supply will be connected to the other pin of the coil or vice versa. If we connect our battery to the right pins you can actually hear the *clicking* sound when the switch turns on. - Set the multimeter to resistance measuring mode. - Turn the relay upside-down to see pins located at its bottom part. - Then connect the other probe one by one to the remaining 2 pins. Only one of the pins will complete the circuit and will show activity on the multimeter. * The question is "Why to use a relay with an Arduino?" A micro controller's GPIO (general purpose input/output) pins cannot handle higher power devices. A LED is easy enough, but large power items such as light bulbs, motors, pumps or fans required more sneaky circuitry. 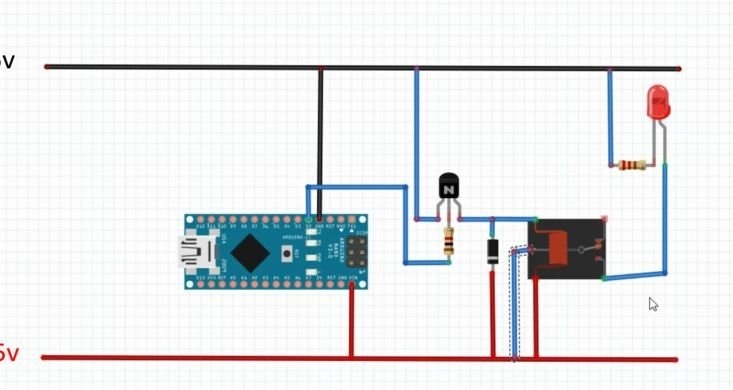 You can use a 5V relay to switch the 120-240V current and use the Arduino to control the relay. * A relay basically allows a relatively low voltage to easily control higher power circuits. A relay accomplishes this by using the 5V outputted from an Arduino pin to energize the electromagnet which in turn closes an internal, physical switch to turn on or off a higher power circuit. The switching contacts of a relay are completely isolated from the coil, and hence from the Arduino. The only link is by the magnetic field. This process is called "Electrical Isolation". * Now a question arises, Why do we need the extra bit of circuit to drive the relay? The coil of the relay needs a large current (around 150mA) to drive the relay, which an Arduino cannot provide. Therefore we need a device to amplify the current. In this project the NPN transistor 2N2222 drives the relay when the NPN junction gets saturated. * Lets start by connecting the VIN and GND pins of the Arduino to the +ve and -ve rails of the breadboard. * Then connect one of the coils pin to the +ve 5v rail of breadboard. * Next we need to connect a diode across the electromagnetic coil. The diode across the electromagnet conducts in the reverse direction when the transistor is turned off to protect against a voltage spike or the backward flow of current. * Then connect the Collector of the NPN transistor to the 2nd pin of the coil. * The Emitter connects to the -ve rail of the breadboard. * Final, using a 1k resistor connect the Base of the transistor to the D2 pin of the Arduino. * Thats it our circuit is complete, now we can upload the code to the Arduino to turn on or off the relay. Basically, when +5v flow through the 1K resistor to the Base of transistor, a current of about .0005 amps (500 microamps) flows and turns on the transistor. A current of about .07 amps starts flowing through the junction turning on the electromagnet. The electromagnet then pulls the switching contact and moves it to connect the COM terminal to the NO terminal. * Once the NO terminal is connected a Lamp or any other load can be turned on. In this example I am just turning on and off a LED. The code is very simple. Just start by defining the digital pin number 2 of the Arduino as the Relay pin. Then define the pinMode as OUTPUT in the setup section of the code. Finally, in the loop section we are going to turn on and off the relay after every 500 CPU cycles by setting the Relay pin to HIGH and LOW respectively. * Remember: It is very important to place a diode across the coil of the relay because a spike of voltage (inductive kickback from the coil) is generated (Electromagnetic Interference) when the current is removed from the coil due to the collapse of the magnetic field. This voltage spike can damage the sensitive electronic components controlling the circuit. 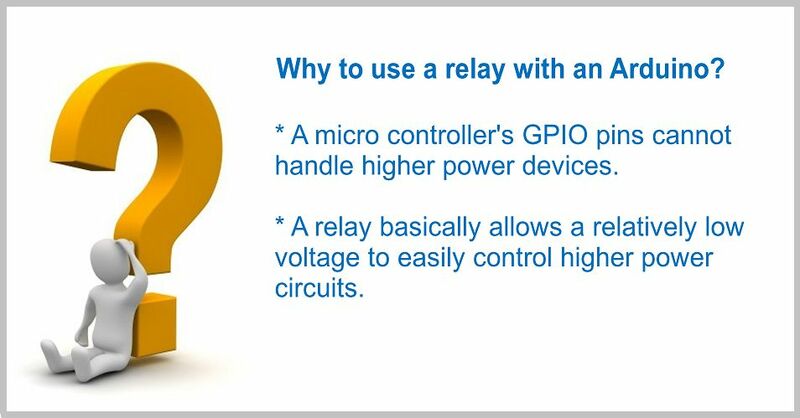 * Most Important: Same as capacitors, we always under-rate the relay to mitigate the risk of relay failures. Lets say, you need to work at [email protected], don’t use a relay rated for [email protected], instead use a bigger one such as [email protected] Remember, power = current * voltage so a [email protected] relay can handle up to a 6,000W device. * If you just replace the LED with any other electrical device like fan, bulb, fridge etc., you should be able to turn that appliance into a smart device with an Arduino controlled power outlet. * Relay can also be used to turn on or off two circuits. One when the electromagnet is on and the second one when the electromagnet is off. 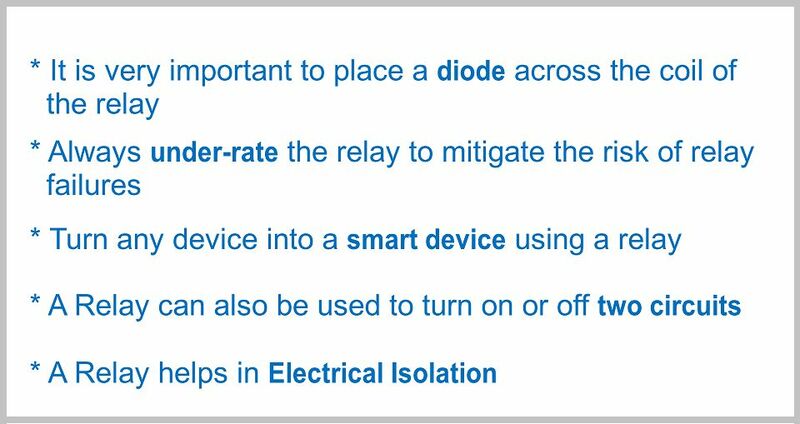 * A Relay helps in Electrical Isolation. The switching contacts of a relay are completely isolated from the coil, and hence from the Arduino. The only link is by the magnetic field. There were 1000+ sperms but I was the fastest one.